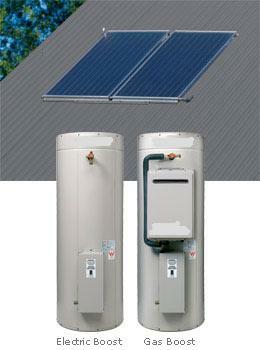 solar hot water units or solar hot water tanks. The close couple solar system is where both the solar collector panels and tank are on the roof. There is no recirculation pump or long pipe runs – reducing heat loss. The roof model solar water tank comes in a stylish range of Colorbond colours to compliment your roof. 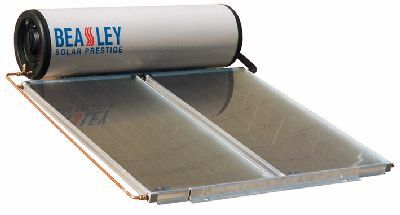 Beasley solar hot water heaters are efficient, economical and low maintenance. The spilt system has the solar panels on the roof and the storage tank on the ground. an electric back up or have a gas booster. can reduce energy bills and ensure you have plenty of hot water. Each Beasley gas boosted solar system incorporates an independent boosting unit. Operates only when the hot tap is turned on and only if the water is not already at 60°C. Continuous flow booster ensures endless flow of hot water. Specifically designed solar gas boosters are available in 2 sizes the S20 and the S26. Available in both Natural Gas or LPG configurations. your location and hot water usage patterns. to either Natural Gas or LPG is not feasible. Often possible to use the cheaper off-peak tariff. On days with good solar gain, the tank will normally reach 60ºC with minimal electric boosting. Full range of element sizes that you can select from. of off-peak electricity periods and your solar zone. Non-frost tolerant panels damaged by frost are not covered by warranty for any damage due to freezing or frost. 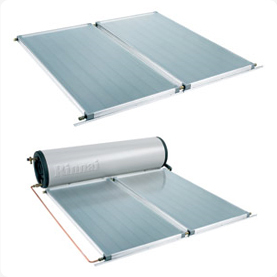 The Rinnai FTC panels are warranted against frost damage caused by temperatures down to -6°C. AMCRO selective surface – long lasting and high performance. 7 riser tubes for effective transfer of solar energy to the water. High efficiency collectors for improved solar contribution. Copper Solar absorber to maximise efficiency in collection solar energy. Aluminium casing – corrosion resistant and ideal for coastal areas. Our service vehicles are fully equipped to carry out hot water replacement and repairs to Beasley Hot Water Systems, Hot Water Heaters, Hot Water Tanks and Hot Water Units including all other major brands. Best of all we guarantee quality service at competitive prices. Turn to us for free advice and quotations for your new hot water heaters or hot water units and receive prompt attention from our experienced and qualified staff. Flo-Rite Plumbing guarantee our friendly and courteous Brisbane plumbers and Gold Coast plumbers are committed to fixing your hot water and plumbing problems first time every time.